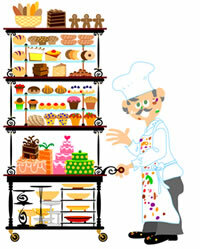 This is our most popular interactive "shop", inviting kids to decorate cakes and arrange bakery samples in a display window. In these activities, children use click and drag mouse movements to arrange elements any way they like on the screen. The creative freedom and playful subject matter make Bobby's Busy Bakery a big hit. Other equally engaging shops on our site include a pet shop, a flower shop, a costume shop, a Christmas tree stand and a pizza restaurant. We recently added a zoo that allows children to arrange the animals, put up signs, and move visitors around. - meet Pumpkin Pirates and tour their "ghost ship"
Sometimes young writers need ideas to tickle their imaginations. 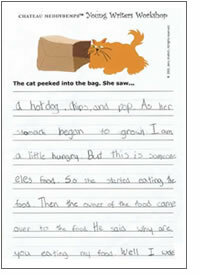 Our Story Starters provide illustrations and a sentence or two to help them begin. 48 free Story Starters are available on our site. 120 more can be purchased and downloaded. To encourage young writers, we periodically publish examples of stories written by children and submitted by their parents or teachers. We've been sending "Published Author" T-shirts to selected authors since 2005. Classic nursery rhymes, plus some inventive storytelling, jumped to the top of our charts at the end of 2013. 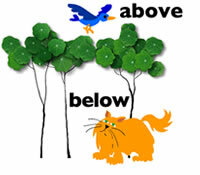 Six rhymes, each retold for three different audiences, still hold an important place in language development. Thanks to our Rhymes and Reasons, English class will never be the same. Select brush size, paint color, and background color, and then doodle away with Magic Paint Brush. This painting tool is easy and fun. Children enjoy the challenge of riddles. 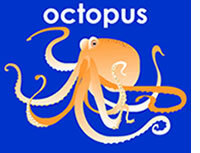 Our twenty Animal Riddles are interesting and always entertaining. 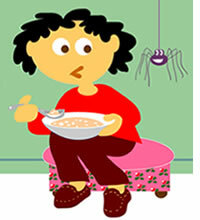 New to the site: Transportation Riddles. Cheery illustrations help young children understand essential Spatial Concepts. Similar simplicity and charm are also used to show Opposites. Beantime Stories is a collection of upbeat and often humorous original tales about Pumpkin Pirates, a Striped and Spotted Purple Pigmoose, Garden Pixies, apes with an interest in geomentric shapes, a troublesome witch, and more. Roughly half are for all ages. The remainder are for young listeners and readers. Frogwart and The Easter Eggs was read more than 10,000 times during the first month after it appeared on this site. This animated spider demonstrates how to draw the letters of the alphabet. The ever smiling and tireless Spinner will repeat his strokes until you choose a different letter. You can open a companion Practice Pad alongside and imitate his movements on the screen using your mouse. � 2014 Jerry Jindrich. All rights reserved.